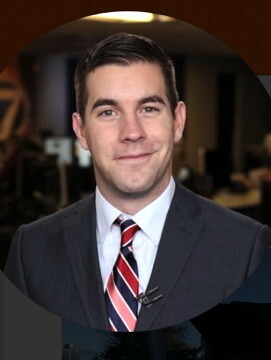 Reporter/Anchor Jason Gruenauer is available. He's currently working in Denver. Jason writes, "I consider myself an enthusiastic and outgoing worker with a bit of a competitive side that strives to do the best possible story every single day." Contract ends 5/31/2018. Please consider him. See all of Jason's clips. 2017 EMMY: Reporter, Best Morning Newscast (Large Market), "Blizzard". KMGH-TV, Denver. Started at KMGH as an MMJ for "The NOW" and promoted twice. Evening Reporter (May 2017 to present). Morning Reporter (February 2016 - May 2017). MMJ/Reporter, "The NOW", Denver (August 2015 - February 2016). Constant use of social media to engage viewers. Fill-in anchor. Team player and multi-tasker. WKBW-TV, Buffalo: Multi-Media Journalist/Reporter (2010 - February 2016). Enterprised, shot, edited, wrote and reported on daily news stories. Reported on-air in live situations as well as working within high pressure deadlines. Experienced as a videographer, producer and assignment editor. Covered a variety of topics including weather, politics, crime, business and sports. Produced content for social media and posted stories daily to Facebook and Twitter. Produced, wrote and anchored sports and news on a fill-in basis for weekend newscasts. WKBW-TV, Buffalo: Production Assistant (2009 ­ 2010). Conducted interviews for on-air use, completed stories for on-air use on deadline, enterprised and pitched story ideas to news department and researched stories. thenewshouse.com, Syracuse: Multimedia Journalist (2009 ­ 2010). NCC NEWS. Syracuse: Reporter/Producer/Anchor (2007 ­ 2010). Citrus Television, Syracuse: Writer and Weather Talent (2007 ­ 2009). Syracuse University, S. I. Newhouse School of Public Communications: B.S., Broadcast Journalism. Linear and Non-Linear Editing, ENPS, EDIUS, AVID, Final Cut Express, Amateur Photoshop, Audacity, Microsoft Office, PowerPoint, Clickability, File Transfer Protocol. Lindsay Radford, former News Director, KMGH-TV, Denver, 720-215-9662. Emily Muniz, former Morning Executive Producer, KMGH-TV, 480-208-4795. Lisa Polster, News Director, WIVB-TV, Buffalo, 716-243-1116.